Meg Bernier (@msteverb) is the assistant director of editorial services and social media in the communications office at St. Lawrence University in Canton, N.Y. When I was younger, I wanted to be a teacher. I loved learning and being in a place where others wanted to learn. I went to college to be a teacher, but quickly realized that while I loved kids and the idea of teaching, there were other career avenues that interested me more. That’s why I love working in higher education so much—it’s the best of both worlds. Last week, I had the chance to teach as I co-hosted St. Lawrence University’s #SaintsGoSocial Digital Identity Education Week, along with Chris Wells, the head coach of our women’s ice hockey team. While it was our second year hosting #SaintsGoSocial, it was the first time the week had a prominent educational component and was open to all members of the campus community. Eric Stoller, a higher education consultant, defined digital identity development best when he wrote that it is “the manner in which we engage, share, promote, and present ourselves online.” Our goal was to get conversations about digital identity started on campus. While we had many ups, we also had a few downs, but overall the event was a huge success. Let me break down for you what we did and how it all went. We hosted several workshops throughout the week: how to build a personal brand; how to use social media; cybersecurity awareness; and LinkedIn 101. While attendance was a little lower than expected, it led to many personal, one-on-one conversations with students where we could answer their specific questions. Another huge upside was the number of faculty and staff members who reached out about bringing these workshops into their classes and possibly including the topic in next fall’s orientation. One of the more successful parts of the educational component was something we did offline: we introduced a poster campaign with several quick, intriguing facts about digital identity. We asked students to take pictures of the posters and share them on social media (and yes, we used prizes to entice them). By sharing these photos, they helped us extend our messages beyond campus. More than 90 photos of posters were shared on Twitter and Instagram and reached more than 5,000 people. One of the battles I face when talking with students about digital identity is that they often think we’re taking the fun out of social media when we tell them that sometimes what they post isn’t always appropriate. In my work, I sometimes come across photos of students drinking heavily at the bar, posts with really vulgar language and people (not just students) using social media to verbally attack another person or organization. These posts could (and often do) change an employer’s perception of a candidate—and not in a good way. One of the reasons we brought ESPN sportscaster John Buccigross to campus is because he still has fun online but remains cognizant of when he should and shouldn’t share a post. He also uses his digital presence to raise money for and awareness about the charities he’s involved with. One of the best things he shared was that he frequently interacts with student-athletes on Twitter and when he sees players using social media platforms to vent, he privately messages them and tells them Twitter’s not the place to do that. When an ESPN sportscaster direct messages you about a tweet he thinks is inappropriate, the odds are that you listen. 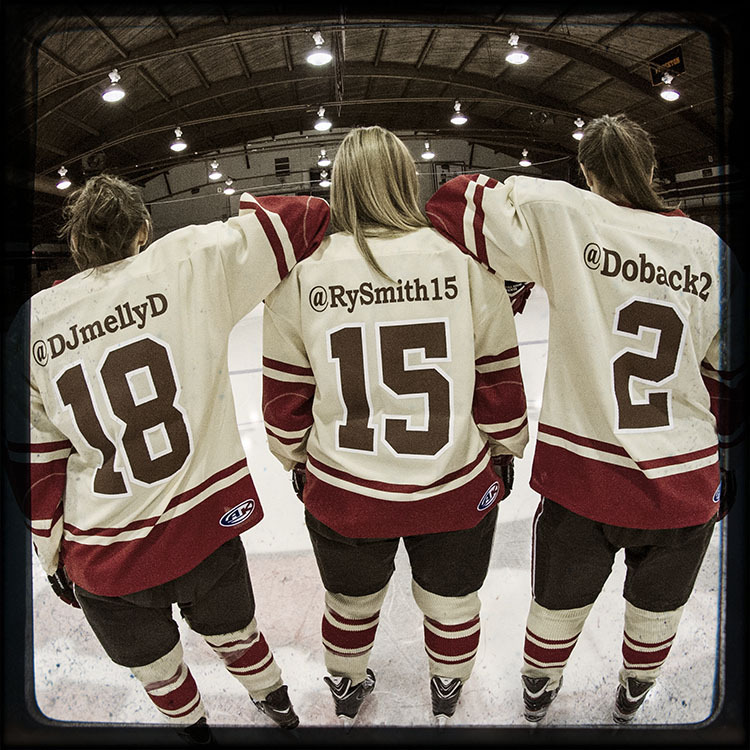 We capped off the week with Social Media Night at our women’s hockey game—the players wore jerseys with our athletics department Twitter handle on the front and their personal Twitter handles on the back. While many might think this was just for fun, I can’t think of a better visual reminder to the players and fans that there is no difference between who you are ”in real life” and who you are online. You wear your digital identity and personal brand whatever you do and wherever you are. As for our student-athletes, they also always represent the university with their activities in digital spaces. I don’t claim to be an expert on digital identity development but in my work, it’s becoming increasingly apparent this education is critical for our students. Many K-12 teachers start this education process early and teach their students about what they should and shouldn’t do in digital spaces, but today’s college students have missed out on those talks. Because of my role as our university’s central social media manager, I see what our students post every day. While much of it is innocuous, I still come across posts that I wish I had never seen more often than I care to say. And as many examples have shown, it only takes one post to change someone’s life. So, whose job is it to get these discussions going on college campuses? Everyone is busy. Call me crazy, but I think in my role as social media manager it’s my responsibility. Many of those in similar positions to mine have spent a lot of time developing our institution’s brand on social media and a lot of our own time developing personal brands. It’s just as important, if not more so, to help our students do the same. If you’re like me, part of your job is to promote, manage and monitor your institution’s brand. Aren’t we, in many ways, protecting our universities’ brands when we take the time to educate students about their digital identities? Don’t we want our students to be better digital citizens because it will lead to better opportunities for them, which will help build our institutional reputations? Promote early to faculty and staff on campus. I received several emails commending us on the work we do. They see the need and they’ll heavily promote it to their classes (and maybe offer extra credit for going to digital identity education week events, too). Do more “in real life” marketing to increase attendance. Our on-the-ground campaign (posters, flyers around campus) caught our students’ attention more than anything else. Even though I like to think our students are seeing every one of my posts on Facebook and Twitter, they aren’t. Next time, I’ll embrace doing more ‘in real life’ marketing. Mix the educational component with a couple of fun events. 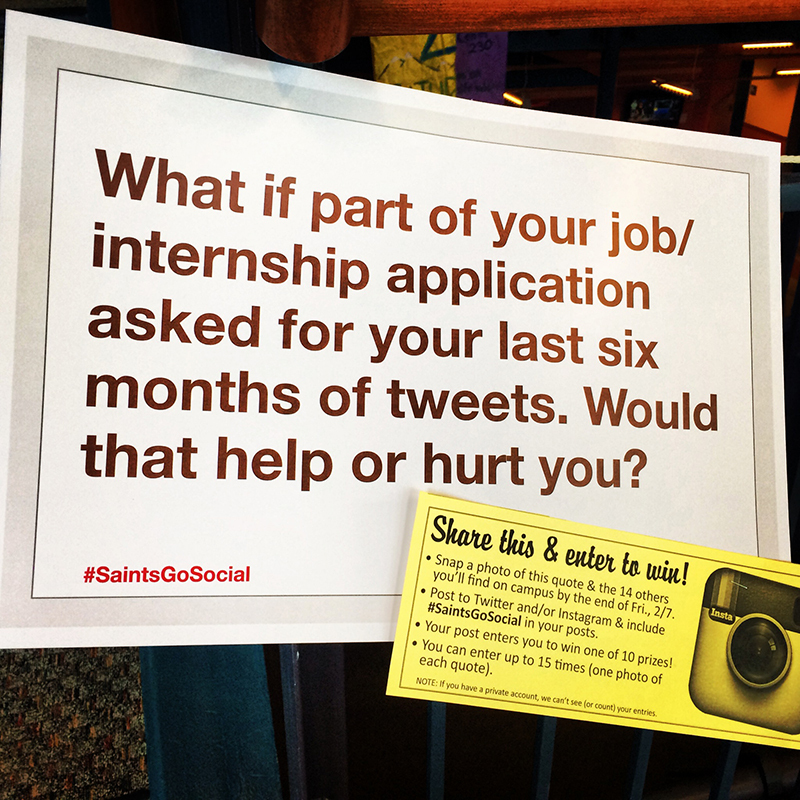 Making the week fun was critical to building our #SaintsGoSocial brand on campus, which is critical for future success. Students took notice and next year when they see the event coming around again, I believe they’ll be much more likely to get involved. Accept that there won’t be huge and immediate payoff from this event. This was hard for me. But I’m really encouraged by my conversations with faculty and even students, who have reached out and said they’d like to meet with me to talk one-on-one about digital identity management. I think these discussions indicate interest in the event and concept of digital identity management, both which will perpetuate its growth in the next few months and throughout the next year. As I start thinking ahead to later this semester and into our plans for next year, I’d love to know: What digital identity development programs have you and your college or university implemented? Meg, this is SOOOO Cool! Major props to you for going above and beyond to create such a valuable series of events for students on your campus. I do not think you are crazy (or perhaps I am as well). I too believe responsibility falls on our shoulders as campus social media managers to get digital identity training for our audiences as coordinated, relevant and exposed (available) as possible across campus. You are spot on that we have a vested interest in caring about the long term personal success of our audience members as well as the impacts to our university brand. I too love teaching so I am doing as many sessions as I can across our campus. We need to take it to the next level though and see if we could pull off a week like you did. Great job! Thanks so much for reading and sharing, Matt! I hope you’ll keep me posted on what you’re doing that’s working, too. Always looking for ways to build this into something even better. Hi Aaron! I’m happy to send you the quotes and facts I used on the posters (though if you search #SaintsGoSocial on Instagram you’ll see many of them on there!). My email is megan.bernier@gmail.com if you need anything else. Thanks so much for reading the blog! I appreciate it.